1. I networked. I don’t do small talk easily and don;t really enjoy new situations, but I ran into several people I knew and met a few others. 2. 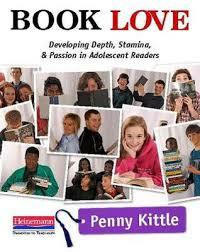 Penny Kittle! The Book Love author really inspired me with her ability to get kids reading. I’ve been waiting for it to show up in the library, It hasn’t so I bought it. 3. Jack Burckemeyer. He made me laugh so hard. He said all the things teachers can’t say. 4. I skipped the 2 hour lunch and made it to two yarn shops. Two more stamps on my passport. I won’t complete the Yarn Crawl, but I’m OK with that.